Having a clogged toilet is the worst nightmare in any household. Unclogging a blocked toilet is a dirty task and often a job that a plumber could probably do best. If you aren’t sure about what you are doing, you could cause more damage than good during your efforts to unclog your toilet. An automatic plunger is a useful tool to have, which can help you to clear your toilet without having to pay over $100 an hour to a plumber for a single visit! There are several different models of plungers ranging from a basic traditional hand-held plunger to semi-automatic options like the Drain Blaster. 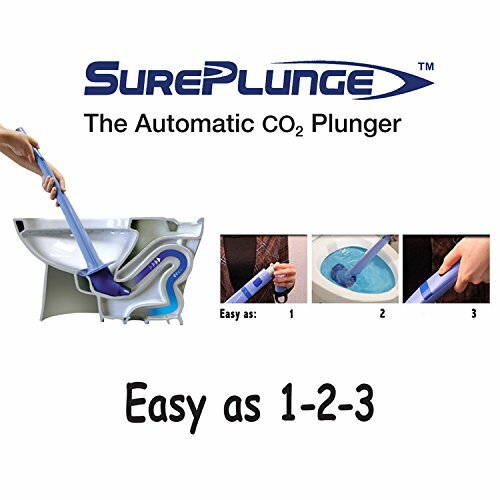 The SurePlunge Automatic Toilet Plunger is really a first in class plunger as it utilizes single-use C02 cartridge to force the gas thru the pipes, breaking up the blockage and sending it on its way. If you are looking for a cheaper option and perhaps less complicated, traditional style plunger- check out our top picks for plungers, including picks for elongated toilet bowls and specific brands including Toto and others. Ease of use: The product you use should be easy to use even by a person who is not tech-savvy. Safe on Plumbing: You don’t want to be unclogging your toilet only to realize that you have to call in a plumber anyway, due to the damage to the toilet fittings. Cost Considerations: It essential that the product should fit within your budget. After all, you need to balance the cost of unclogging your toilet with the rest of your household budget! Quick and preferably free shipping; It is always a bonus to be able to receive your new product within just a few days, and if shipping is free, that’s still an added advantage. Here is a product that should help you in the best way possible to clear a clogged toilet bowl. The central principle behind the SurePlunge automatic toilet plunger is that it delivers a regulated blast of compressed carbon dioxide (CO2) without needing to use corrosive chemicals. An essential feature of this automatic toilet plunger is that it has a unique, irregularly-shaped seal designed to fit any size of a toilet bowl. Due to its odd shape, the drain line of a toilet bowl is a somewhat complicated piece of plumbing if you need to unclog it. The common tendency is to call a plumber. However, they are not always available when you need them, and the hourly rate of a plumber can make a sizeable hole in your pocket. This automatic plunger ensures that you can unclog your toilet bowl instantly and cost-effectively. 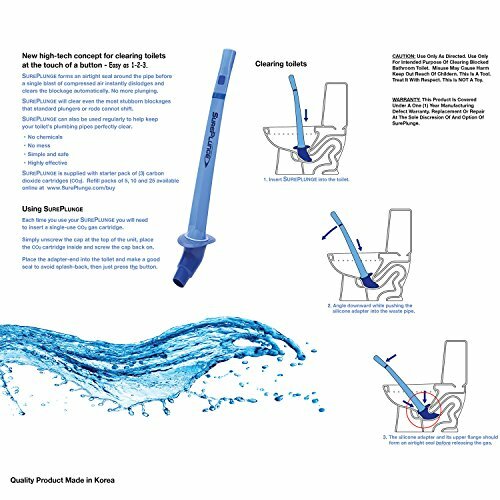 This heavy-duty toilet plunger is easy to use, and each single-use CO2 cartridge is equally easy to install. When you push the plunger against the toilet drain, the seal presses against the sides of the toilet bowl to form an airtight enclosure. Now, with the push of a button, a burst of CO2 gets released and directed towards the blockage. Provided that the plunger is held firmly in place, the CO2 builds up a sudden pressure within the enclosure which dislodges the blockage. The design of the autoplunger is such that the maximum pressure generated within the plumbing system is well within the pressure rating of the pipes so that there is no risk of damaging the piping due to excessive force. You may ask yourself this question: “How safe is this product?” you can rest assured that it is safe, as CO2 is a harmless gas and the pressure that the plunger generates within the toilet is not dangerously high. Ensure that the plunger is held firmly in place, deep into the toilet hole before pressing the CO2 release button. This procedure should prevent a kickback which can hurt you. Do not fool around with it or allow others to do so. Prevent exposure to direct heat (120°F) and keep out of direct sunlight. Since this is a pressure device, you would be well advised to protect your eyes and face from unexpected splashes to the eyes. Q: Can we use the SurePlunge on an RV toilet? A: Unfortunately, NO. RV toilets re-designed differently, and you need to consult the user manual for correct maintenance. Q: How many CO2 cartridges come with the SurePlunge? A: You will get three CO2 cartridges with each SurePlunge automatic plunger. SurePlunge Replacement cartridges can be purchased in refill sets of 5, 10, 15, 20 and 25 and you can save money by purchasing them in larger quantities…getting the price of single-use down to approximately $1 per use. Q: Won’t the pressure of the SurePlunge auto plunger damage the plumbing? A: The maximum pressure buildup in the toilet when you release the CO2 is carefully designed not to exceed the maximum internal pressure rating of the fittings, so your plumbing is safe. Q: Is the gas used in the cartridge of this heavy-duty toilet plunger safe? A: The gas used in this automatic plunger is carbon dioxide (CO2), which is the same gas used to create fizziness in soft drinks, so yes, it is safe. Q: What is the difference between an auto-plunger CO2 and the Drain Blaster? A: SurePlunge Automatic Toilet Plunger uses carbon dioxide gas from a single-use cartridge to pressurize the toilet to dislodge a blockage. A compressed air plunger, on the other hand, uses a piston to generate compressed air. 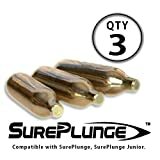 Read customer reviews of the SurePlunge here. It is also considered safe on your plumbing, with the SurePlunge you could end up saving money in the long run, as you don’t have to call a plumber every time your toilet gets clogged. If you are not sure you really need an automatic plunger but want ways to unclog toilets without using chemicals see this article. 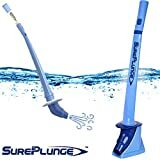 We hope you have enjoyed reading this review of the SurePlunge and have been able to help you find the best automatic plungers. Please feel free to leave your comments and feedback and questions if any, and we will be glad to respond.